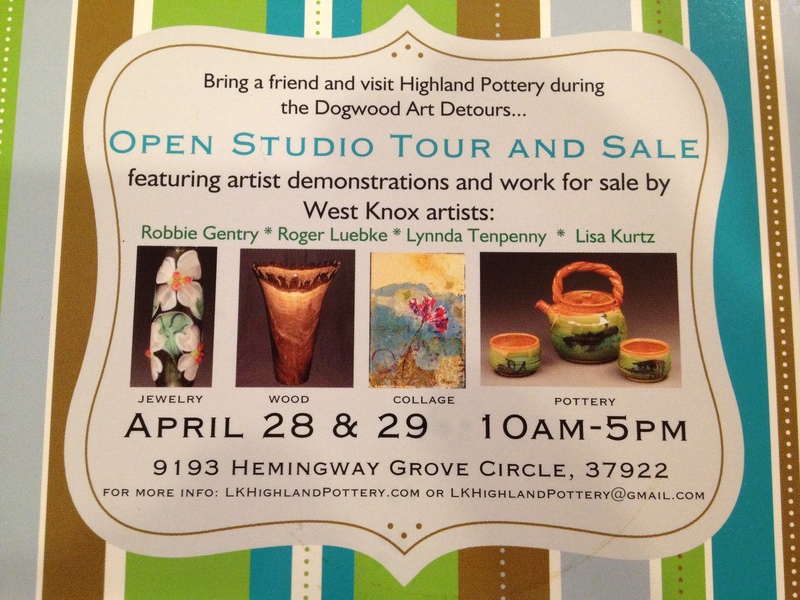 Art DeTour 3: Highland Pottery | Oh, the Places We See . 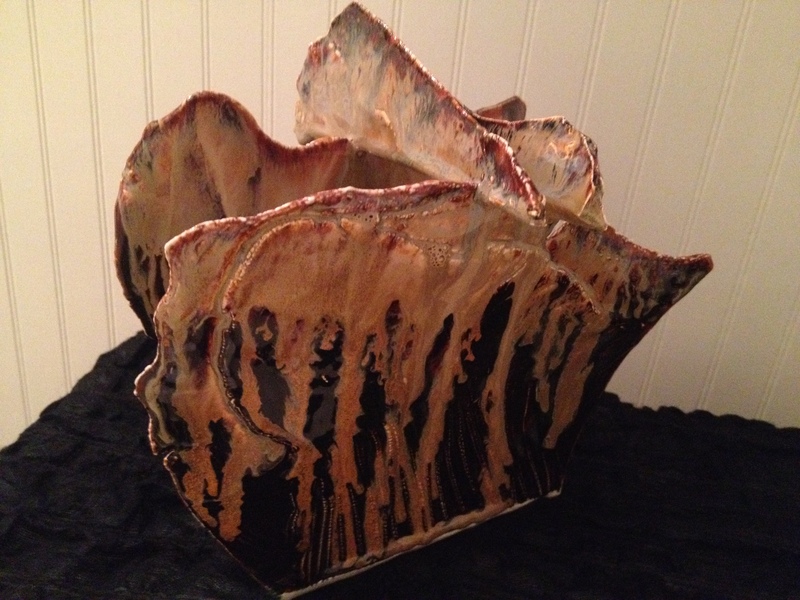 . .
You see, my love of Lisa Kurtz’s pottery began at the Webb School ArtXtravaganza when this drippy brown, ragged edge piece beckoned . . . again and again and again. Believe me, I resisted. I told Lisa I was looking for a simple vase – something to hold alstroemeria or tulips or hydrangeas from my backyard. But this piece kept calling. I turned it around and around. Lisa gathered a handful of daffodils and set them haphazardly (fittingly) into the piece. I admired the irregularities, the randomness, the unique angles. And then I said, Wrap it up! At that point, she handed me this card that stayed on my fridge ’til I could see Lisa, the maker of this hand-built flower holder or whatever you call this piece (a vase? 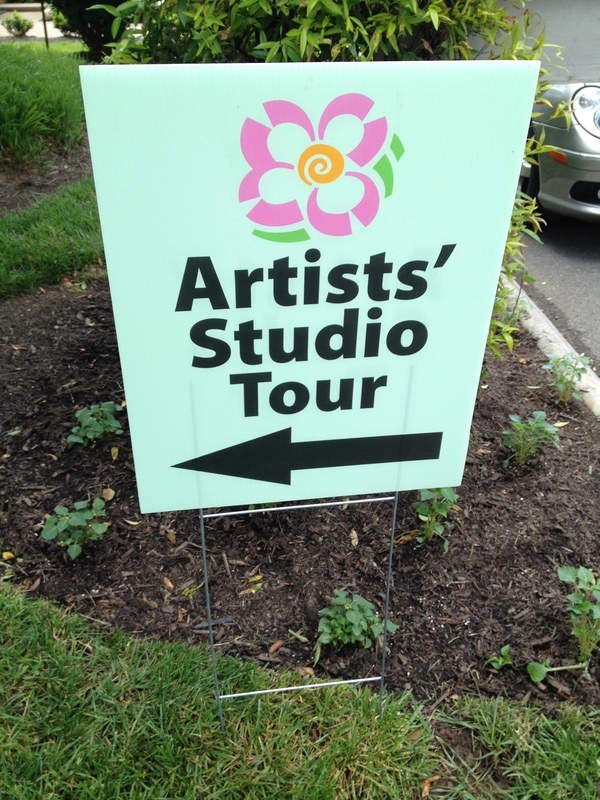 ), once again — at the Dogwood Art DeTour. And the best thing to look forward to? More artists joining her at her own home! Su-weet! 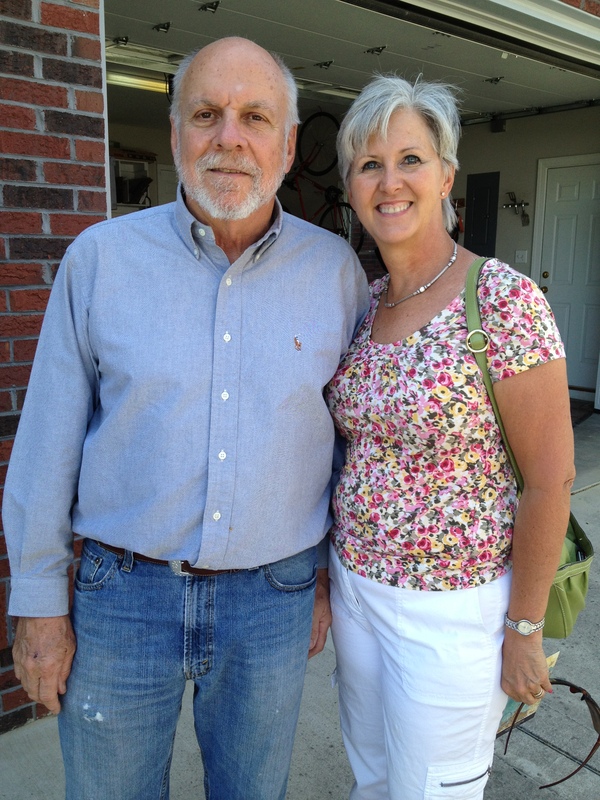 We arrived at her home in West Knoxville only to see another of my favorite artists — Joe Parrott — and his wife Nancy. Joe’s latest scenes of Knoxville are nothing less than classic , so I was glad to see someone with good taste haunting the same artsy places my friend Pat Medley and I had chosen from the vast selection of open venues for Art DeTour. We met Roger Luebke, premiere woodworker, who, surprisingly enough, had taught algebra to Mark Medley, Pat’s husband, at Holston High years ago! 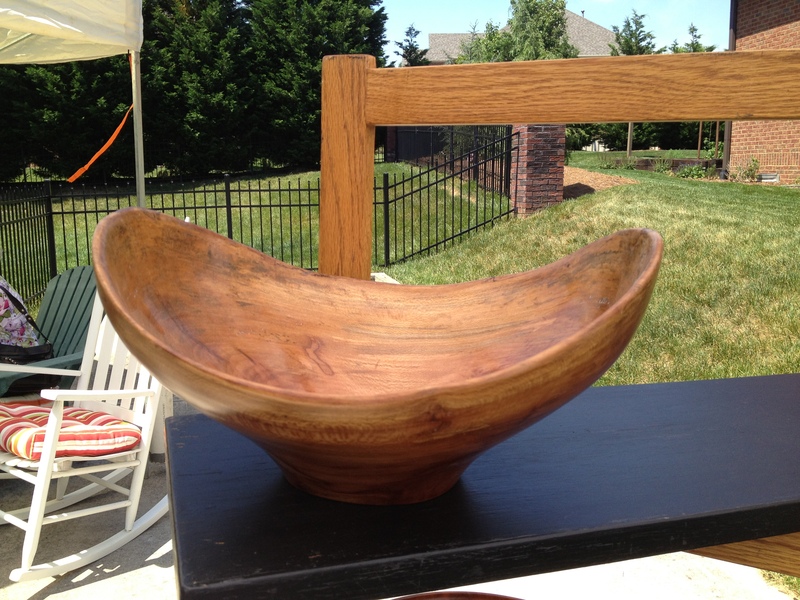 It’s one thing to look at a rough piece of wood — just turned but not rubbed . 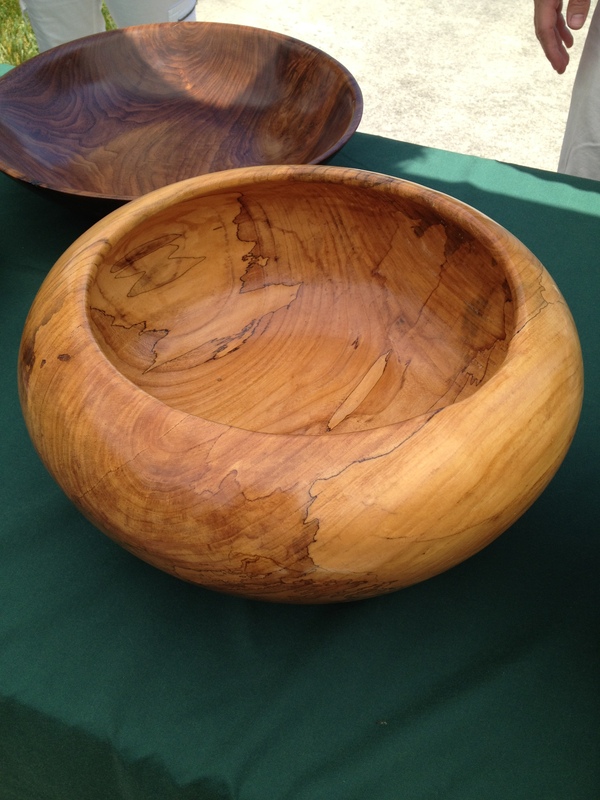 . .
but when you touch a finished bowl, you feel that smooth, natural surface brought to life by an artist. And Roger is an artist. 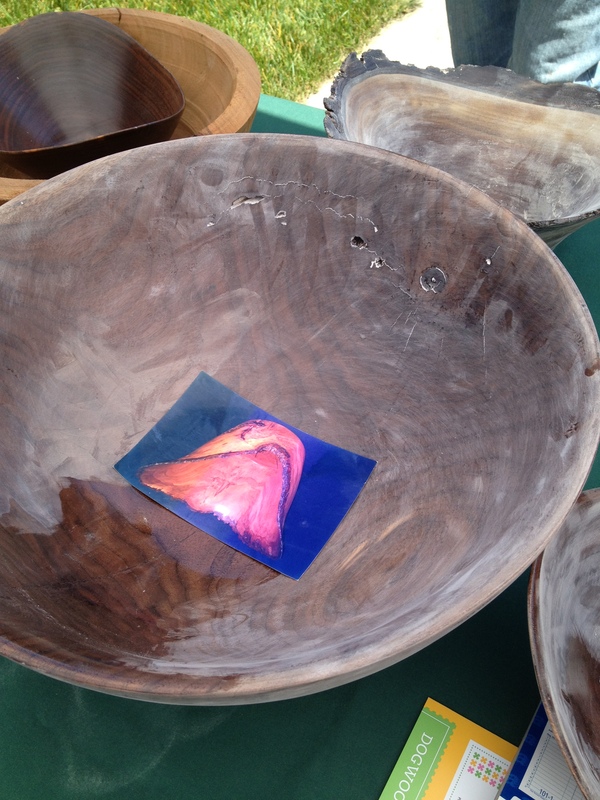 Then you become sort of a wooden bowl snob, turning it over to see the tree origin, asking questions about the form, the wormy holes, or whatever makes the piece unique. And we grilled Roger on this one, the one we loved best — form meets function meets art! 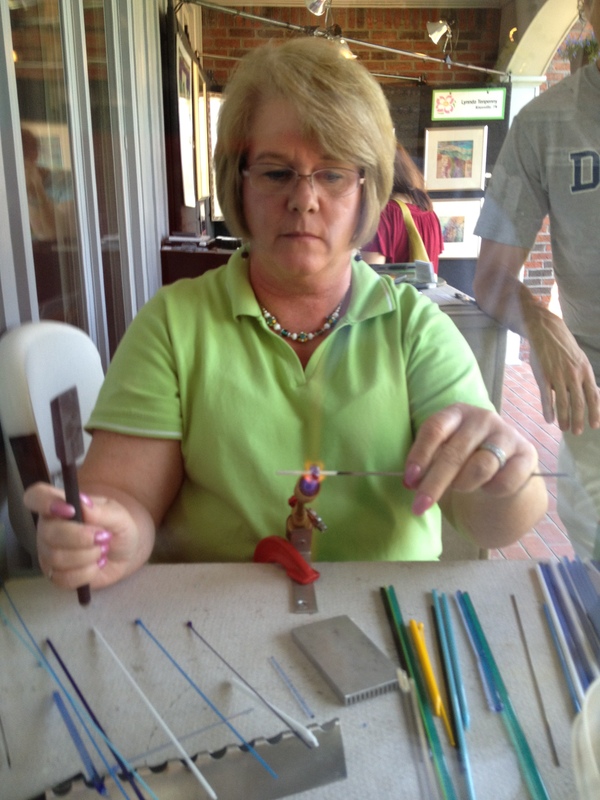 Robbie Gentry, glass bead jewelry artist, set up on the porch. 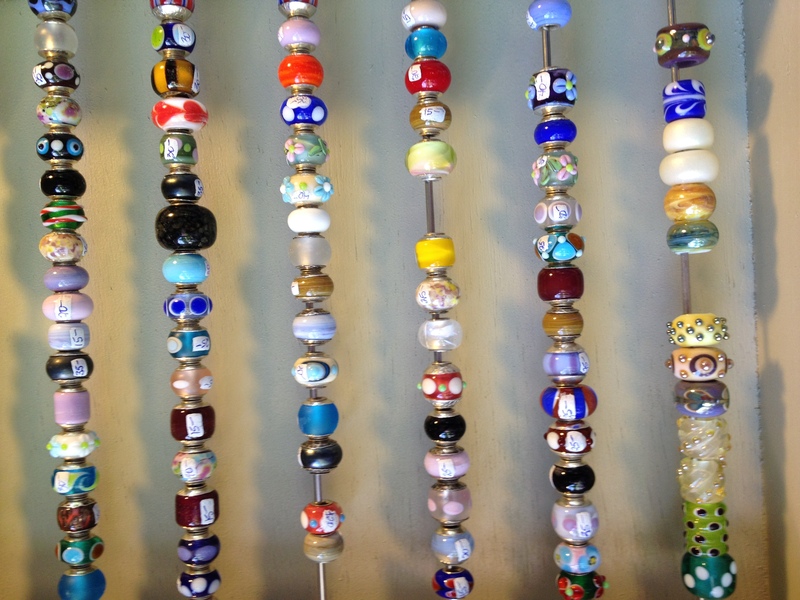 She displayed her finished pieces — necklaces, bracelets, one-of-a-kind creations . . .
but she also demonstrated her craft, letting sparks fly as they may while she formed one bead — smooth, bumpy, or bubbly — at a time. 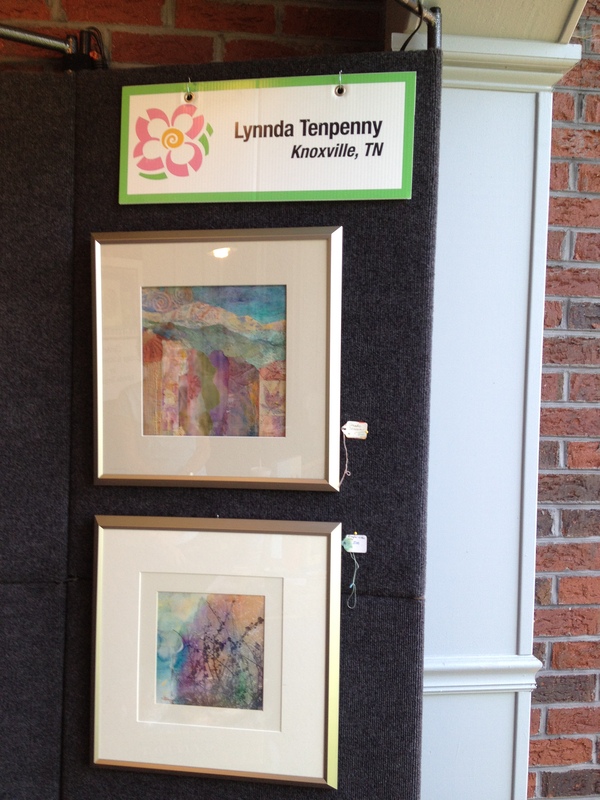 Lynnda Tenpenny, also on Lisa’s porch, let us look closely at her displays: mixed media collages, both framed and under construction. 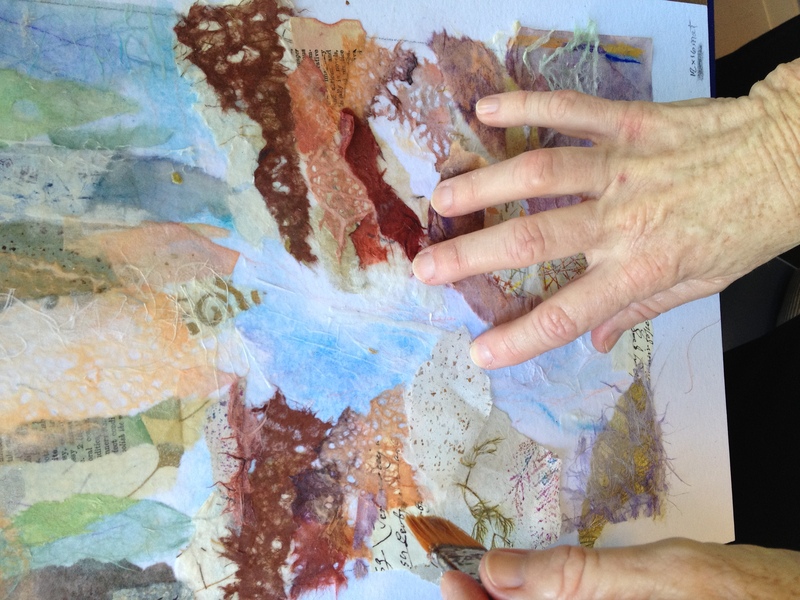 She showed us how she selects, places, and tears, if need be, pieces of hand-made paper, interesting scraps, string or what-have-you. 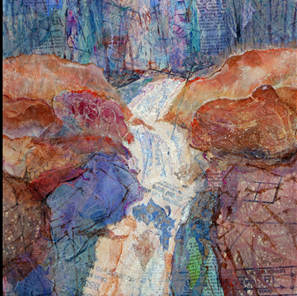 Her website showcases paintings, too, like On the Way to the Sea which won 1st place in the Smoky Mountain Anniversary Exhibit. But, of course, I had to find Lisa, and there she was . 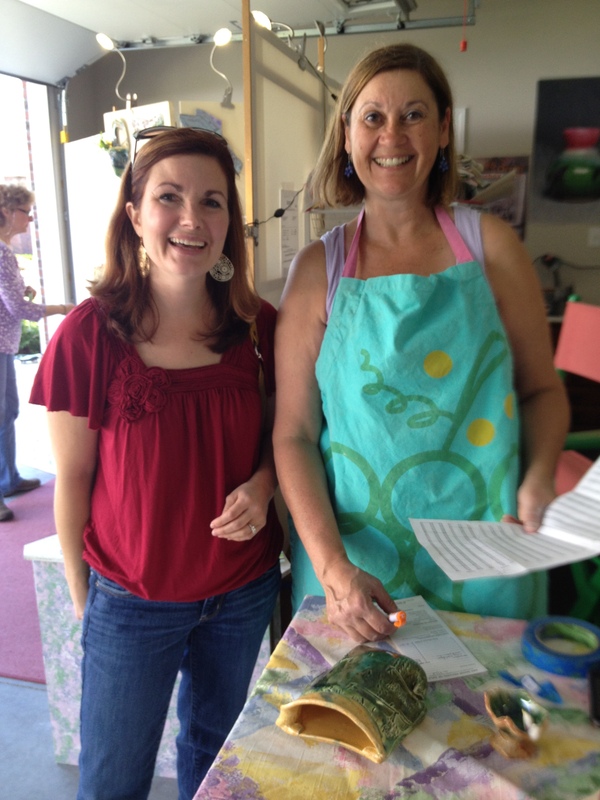 . . in the garage with her friend Dana Barnes (on left) talking about Terra Madre – Women in Clay, a local group of women potters. Another visitor, Candy Finley-Brooks, perked up at our discussion because she’s in Terra Madre, too. I had just recently visited their exhibit at Blount Mansion, so I could add my enthusiastic comments to theirs about the work of these women who create art– like that drippy brown piece Lisa made that I dearly love! 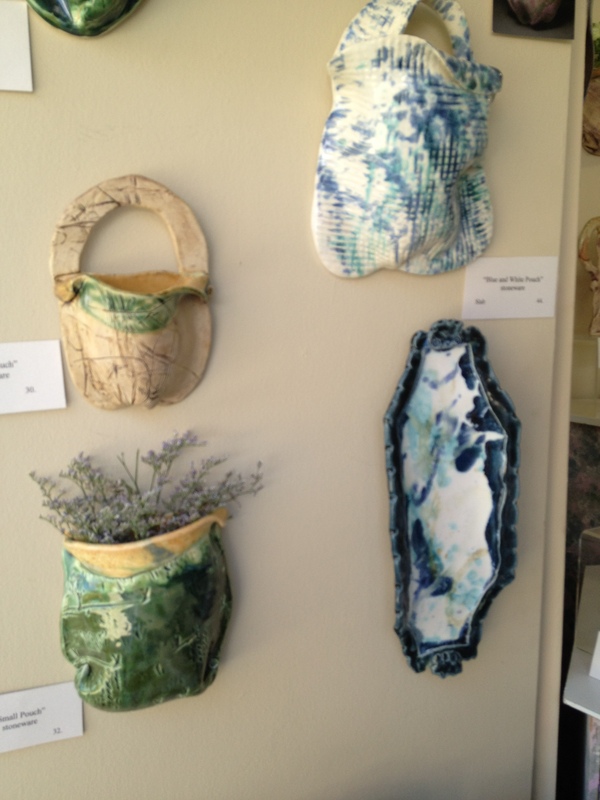 For today’s Art DeTour, Lisa had wall pockets . 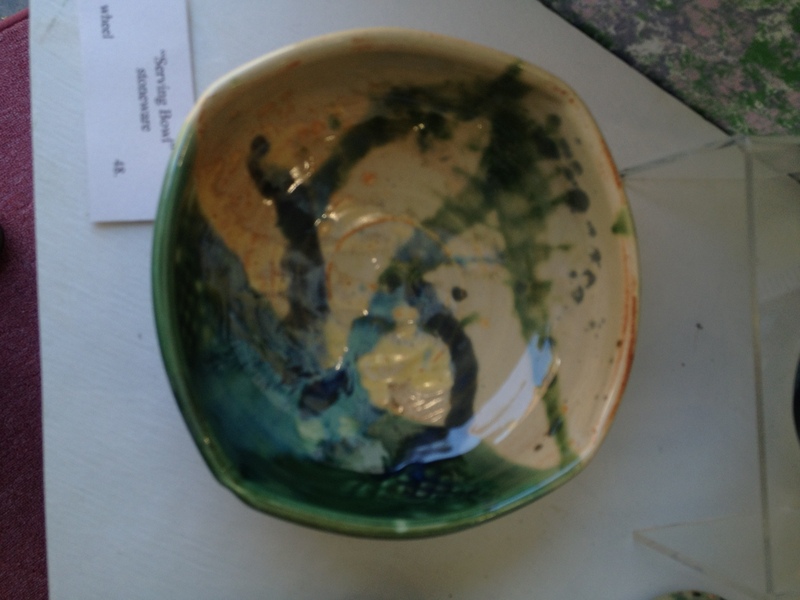 . .
bowls decorated with random flings of glaze (well, they were sort of planned!) . 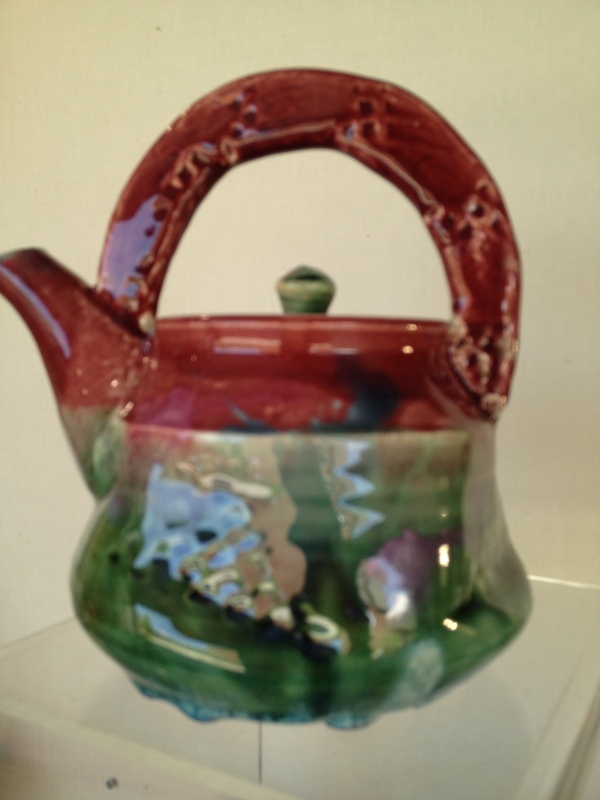 . .
and hand-build tea pots with an Oriental flair. Google Lisa Kurtz Highland Pottery, and you’ll find that this talented potter has inspired her whole family to be involved in art in some way. 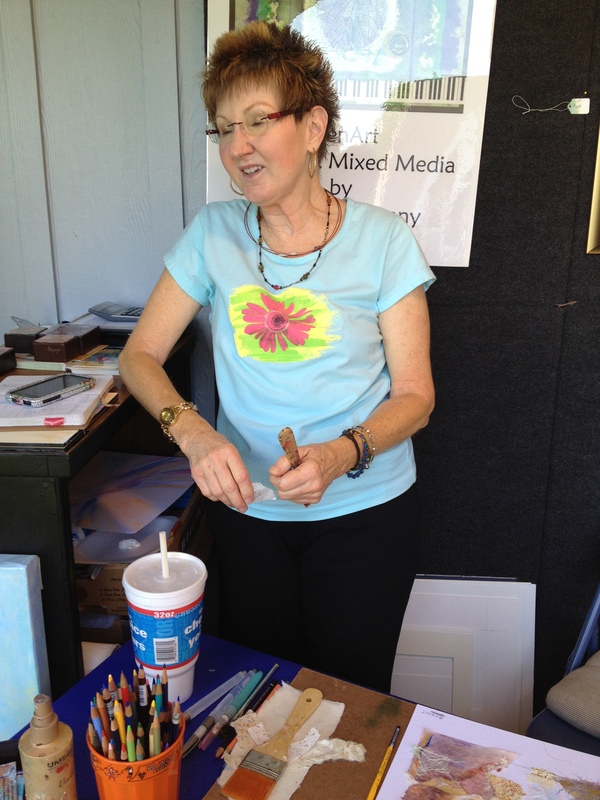 You just might see her at the Art Market Gallery in downtown Knoxville where she does some of the scheduling! Oh, these Knoxville artists — creative, hard-working, personable! No wonder the Dogwood Arts Festival is right here! What do you think? Have you got a favorite artist from Knoxville? Or somewhere else? Let me know. There are soooo many more places we need to see! 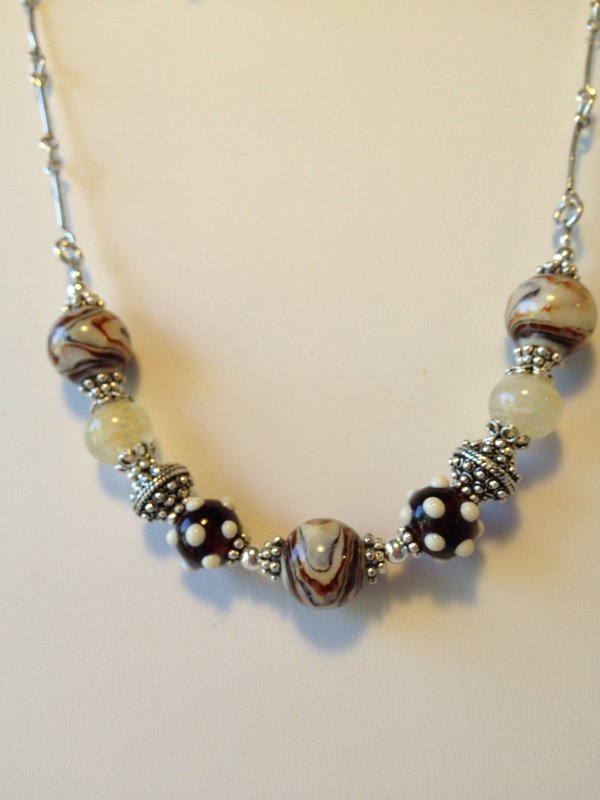 This entry was posted in Travel and tagged art, Dogwood Arts, Knoxville, pottery. Bookmark the permalink. Pingback: Terra Madre: Women in Clay — Dogwood Arts 2014 | Oh, the Places We See . . .
Wow, I was so glad to see this post, Rusha. I love Lisa’s pottery so much that last year I commissioned her to make me 10 brie bakers. I used these beautiful little baking dishes as hostess gifts all year and the recipients loved them. I’m glad you and Pat went on this tour and took the fun photos to share! 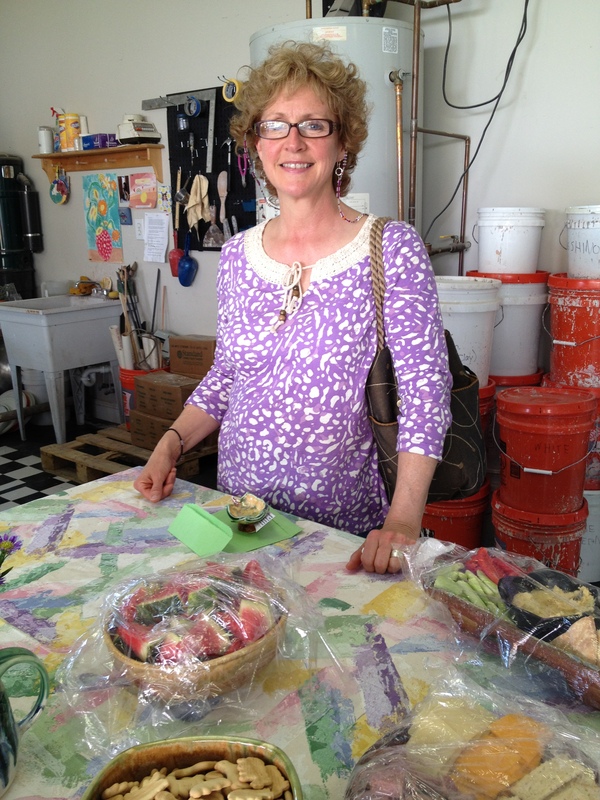 I’m sooo jealous of your brie bakers by this fun-loving, interesting potter! 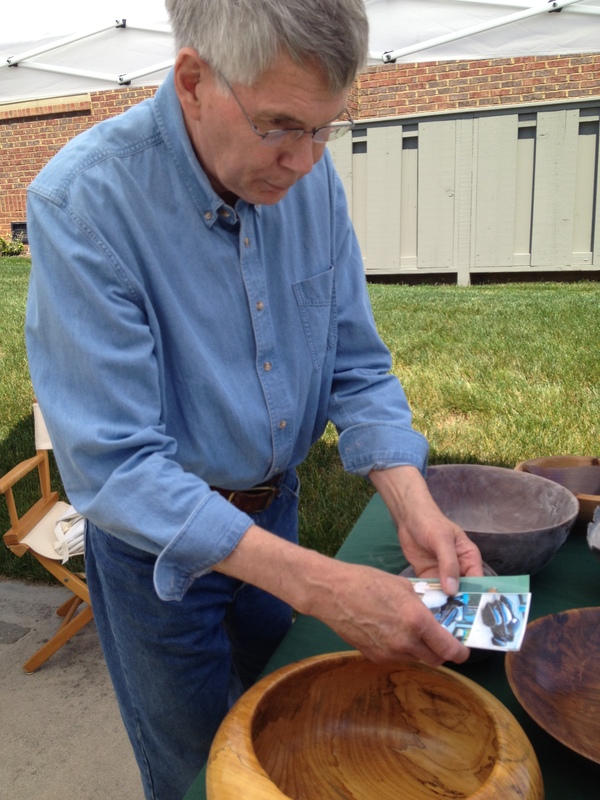 I love this Dogwood Arts event that lets me peek inside the workshops & homes of area potters. I’ll be back!